"There's poop everywhere! Y-u-c-k," says 6-year-old Jordan Lien as he and his family dine at the Modern Toilet, a popular Taiwanese restaurant chain that's expanding into China and other parts of Asia. The boy was looking at the poop-shaped lights and dish covers and the curry on toilet-shaped plates. Toilet creations aren't new to China. The ancient Chinese may have been the first to use the throne  a flush toilet was found in a tomb of a Western Han Dynasty (206 B.C. to A.D. 24) king  and they invented toilet paper in the 6th century. Modern Toilet owner Wang Zi-wei, 29, an ex-banker, got his idea from the Japanese robot cartoon character Jichiwawa, who loves to play with poop and swirl it on a stick. Inspired by that image, Wang began selling chocolate ice cream swirls on paper squat toilets. 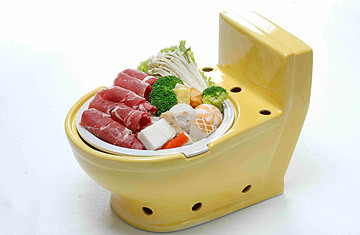 Customers loved them and wanted more edible excretion experiences, so he opened Modern Toilet in 2004. The theme-restaurant chain now has seven outlets in Taiwan, one in Hong Kong and one opening in Shenzhen, China, this week. Plans for other cities in China, Macau, Kuala Lumpur, Malaysia are also under way. Dinner à la latrine, anyone? See pictures of bug cuisine.